The vineyards of South Africa cover 140 000 hectares mainly in the province of Western Cape. Please, have a look to the map below. South Africa was the 8th biggest wine producer in the world in 2015 with around 1,130 million liters of wine produced, just before China (source OIV). Most of the production is exported to countries like the UK, Germany, Japan, Russia, Ireland, Denmark. 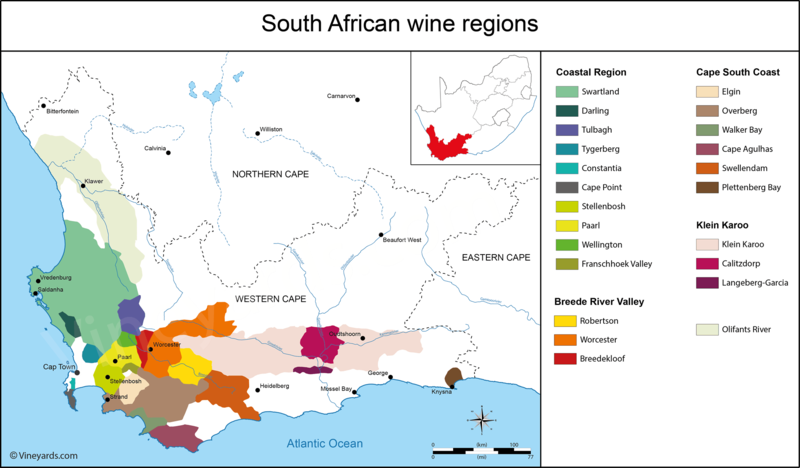 Wine has been produced in South Africa for longer than in any other of the new world countries. In the 1600s, French Huguenots, Dutch and English settled down near the Cap of Good Hope in Constantia, and in the district of Franschhoek where vineyards where then planted. Today, the main grape varieties planted are: Pinotage (SA signature grape), Chenin blanc, Cabernet sauvignon, Colombard, Chardonnay, Sauvignon blanc, Syrah, Gewurtztraminer, Riesling, Trebbiano, Sémillon and Muscat d'Alexandrie. The Wine of Origin, WO, appellation system defines about 60 appellations under four categories which are from largest to smallest: geographical units, regions, districs and wards. The WO mark on the label indicates that the grapes used in making the wine originate from this labeled area.